A few weeks ago I was inundated with CD’s, so I glanced at a couple of accompanying Press Releases, which I desperately try to avoid until I’ve made my own mind up about a record; and because this one highlighted The Barker Band’s English Folk heritage I put the album to the bottom of the pile. HUGE mistake! Earlier today Wandering Girl came on my car stereo via the ‘random button’ on the I-phone and the intricate banjo picking; which is almost ‘Indie’ at times and Nella Johnson’s sweet voice had me carefully checking to see who it was; and I didn’t recognise the band’s name at all; but that was rectified at the next Service Station when I put the album on in its own right; and the next two hours in the motorway sunshine flew by. The album opens with the haunting Fishing Songs Pt I & II, with Nella singing about her handsome lover who was lost at sea and in Pt II Sam Barker takes up the tale as the band pick up the pace creating a modern day sea-shanty. The same theme is picked up on Don’t Leave For Sea; but this time their Folk roots do come through on a two-parter story that oozes excellence from start to finish. With songs like Cry, Cry, Cry with Barker singing and Nella, again on the elegant You Took the Best of Me there’s no way you would believe the Barker Band were a Folk group rom West London and not a Roots/ Americana band from Rural America. While not quite Southern Gothic as I understand it, Cut Up His Face is a truly absorbing bitter tale of jealousy that conjures up all kinds of images for the listener; and had me replaying it several times. Ooh; I have to admit to going all tingly listening to Nella’s smoky voice on the sultry and ambitious Leave My Bonny; and when the male members of the ensemble make their appearance it’s like a choral society performing in Musical Theatre; and well worth a listen. Tucked away in the middle of the album is a wonderful song with a fascinating story, as Don’t Fear The End was written to commemorate the Barker twins father Lenny who was an original and integral part of the band until his death in 2012; leaving a hole in their lives and indeed the band; plus in simple terms it’s a song that will resonate with most people who have lost loved ones. 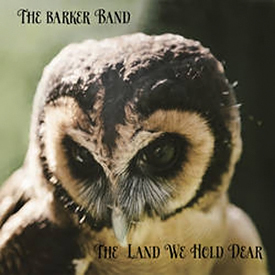 I’ve talked a lot about the vocals; but the Barker Band are much more than just a vehicle for the singers, with twins Jake and Sam Barker being masters of their respective banjos, mandolins and guitars plus band members Tom Wright, Laurie Sherman, Simon Cohen and drummer Ru Sheeve all play their parts; albeit understated at times to create an album that channels Union Station through Fairport Convention.